Ricoh India has launched its new Pro C9100 series of color production printers for the heavy production segment. 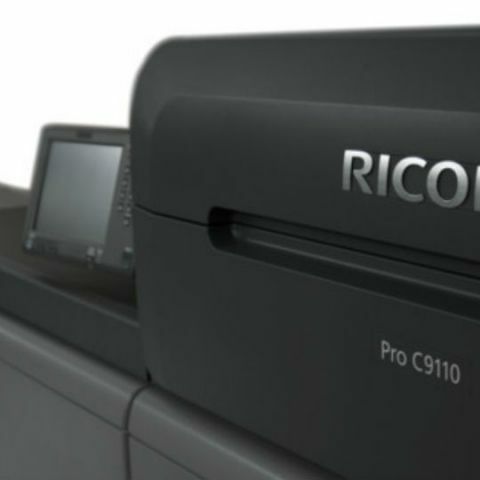 The series debuts with two printers: Ricoh Pro C9100 and C9110. Both of them support maximum recommended monthly volume of 1 million A4 pages, along with print speeds of upto 110ppm and 130ppm respectively. The printers also come with Ricoh's improved Vertical Cavity Surface Emitting Laser technology, which helps them in delivering image quality up to 1200x4800 dpi. Ricoh India Ltd. a leader in the field of Imaging Solutions & IT Services, today announced the launch of RICOH Pro C9100 series for the heavy production segment - a new generation of production oriented, reliable and durable high volume digital presses. These new generation digital production presses are especially suited for large commercial printers and high volume print for pay setups seeking to expand their hybrid digital and offset infrastructure complemented by easy integration into existing operations. The new additions are productive from the first page out and deliver high volume, personalized print runs with fast turnaround times. The two new production workhorses Ricoh Pro C9100 and C9110 will help the customers to migrate additional volumes from offset to digital, while also positioning Ricoh in the industrial space. Both devices boast a maximum recommended monthly volume of 1Million A4 pages, as well as high print speed of 110ppm and 130ppm. Print quality is assured with the inclusion of Ricoh’s enhanced Vertical Cavity Surface Emitting Laser (VCSEL) technology, delivering image quality up to 1200 x 4800 dpi. Regardless of paper weights, the Pro C9100 series prints at rated speed, and productivity is further increased for A3, enabling 75 ppm for A3 or 150 ppm for A4 or equivalent. Ricoh is offering the new presses with a choice of EFI digital front ends, including the EFI E-43 or the faster E-83 print server. Other new features include air assisted duplex banner printing, up to 700mm in length, from a bypass feed unit. Compatible substrates include uncoated, textured and coated media, plus specialty media such as super-gloss, magnet, metallic, transparent and synthetic. Print services providers seeking to expand their offerings will also be able to quickly take on a wide range of new commercial applications with the RICOH Pro C9100 series’ capability to print onto uncoated, textured and coated media from 52 gsm to 400 gsm, duplex banner sheet printing up to 700mm, and even special media such as super-gloss, magnet, metallic, transparent or synthetic. This allows them to easily extend their expertise to include light packaging, direct mail, books, promotional materials, brochures and business cards. With these new models, Ricoh aims to deliver affordable digital color production presses that offer productivity, wide media handling capabilities and excellent print quality, breaking down previous cost barriers for clients looking to enter the digital colour production space at these high speeds. Ricoh’s continuous commitment to innovation means that commercial and corporate print clients can select the optimal blend from the company’s fast expanding portfolio of production-oriented products and solutions to support the profitable evolution of their businesses. • Media support up to 400gsm in both simplex and duplex at rated engine speed. • Reliable throughput of the wide range of supported media is ensured by the use of Ricoh’s new vacuum feed technology.